Damn i like this brand. Cool, great sounding designs and lots of them. And i was surprised the schematic was up at their site. I only have a few originals, but i'm strongly tempted to get more..
We combined the best elements of a Tone Bender MkII fuzz with a Rat distortion to create something that sings like a fuzz but is tight like a distortion. It loves humbuckers and single coils. It loves your cranked amp and your super-clean amp. Katzenkönig was tuned to offer a huge range of response – from a really beautiful singing tone, to tight, harmonically-rich crunch, all the way to fuzz mayhem. INPUT – Controls the input sensitivity. Turn it down when using higher output pickups and humbuckers or to dial in your wah sound (more on that later). Turn it up for lower output pickups or for when you want to go over-the-top! GAIN – Controls the gain of the second gain stage. It is not a conventional gain control, rather, it controls the amount of negative feedback in that stage. What does that mean for you? It means you get a wide ranging gain control that sounds great throughout it’s entire rotation! FILTER – Allows you to dial in your final tone from smooth and creamy all the way to bright and cutting. You can quickly find the sweet spot for your rig with this control. If you are familiar with the Filter control on a Rat then what you’ll find is that this is an even better version of that idea! VOLUME – Standard volume control. You’ll find that Katzenkönig sounds great turned down quiet or cranked up and loud! To get familiar with your new Katzenkönig, let’s begin by plugging it straight into your amp set to a clean sound with no other pedals in the chain. Set the controls as follows: Volume – noon, Filter – noon, Gain – minimum, Input – minimum. Now play a bit to get a feel for how it responds. Go ahead and mess with the Filter knob to see how it works. You’ll notice that unlike most fuzz and distortion pedals, Katzenkönig sounds great at minimum gain settings. Now go ahead and start experimenting with the Gain and Input controls. You’ll notice that they both increase gain but in different ways. Leave one at minimum and start turning the other up. Then leave the other at minimum and turn the other one up. And yes, cranking them both up leads to extreme fuzz, sustain, and saturation! At lower Gain and Input settings, Katzenkönig’s response is tight, like a great distortion pedal. You can play chugging, palm-muted riffs that you wouldn’t be able to get away with on a standard fuzz pedal. But turn up the Gain and Input, and you can get those epic harmonic blooms that you normally associate with a great fuzz pedal! Yes! Thank you, I found a perf layout for this that I was going to try eventually, but I much prefer stripboard. Definitely going to try sometime, hopefully soon! Hey man should 'To circuit' be (jack) input? Thanks for the layout. Verified! Had a spare hour. Sounds just like the original. Used 5088s. Thanks for the layout Miro. Built too, sounds great. Thanks to the dream team. Built and sounding good over here as well. Mine seems to be a little shy of unity with the volume full up, anyone else experience the same? Ive had problems with level before too and it was usually a wrong component value andthere is 1 1nf and 1 1uf close together. If thats not the case check your solder joints and knife the strips. One could try tweakin the values for 2K2 and 3K9 coming from Q3 collector. Bias with ones transistors might be slightly off and that could cause lowish output level. ok tayda doesnt have the 1uf cap in mylar but has it in a box type, i guess ill use that, unless I can use a 1uf electrolytic. Any help? You can definitely use box types there. Great layout, Miro! Really compact and tidy, thanks a lot!! I also used BC550b transistors, 2n5088s was too much gain for me but I only tried those before reversing the controls so it was really just a couple of minutes of testing, I put the bc550B's (gain around 300) and it sounds fine! Thanks. I'll check the gain control labels once i'm back home. Thanks for the layout Miro! I used BC500's in mine and it sounds great. I put a MP38A in the top left spot just to see what happens and it sounds kinda cool, I might leave it in there. OK I dont get it, I see the Tonebenders gain stages but I dont see anything that has to do with the RAT's gain stages. I am trying to familiarize myself with the inner workings of distortion pedals and I dont understand this one's anatomy. Hard clipping diodes shunt to ground. As in OD250, Dist+ and a Rat. Also the Filter control is straight out of a Rat. I built one since I seem to be on a Tonebender-bender. Sounds good, quite easy to get usable sounds, but there is some hiss, which apparetly is present in the original as well. I'll have to settle on which transistors to use first, but this will definitely get boxed up! Maybe some lower gain ones than the suggested 5088s could work better here. I was playing around with the circuit today and swapped my original transistors (around 500 hFE) to lower gain ones (around 300 hFE). Sounds much better now, with more response to the gain and input controls. I'd also suggest socketing the diodes and trying out different ones. Ge's sound pretty good as well as LEDs (nice and growly), but for now I think I'll use either 1n914s or 4001s. Really curious for this one, will build it for sure! Thanks! Is it maybe possible to add Catalinbread as a tag for future reference? Thought i had it there but didn't. Thanks for noticing. Added. Do the unused terminals on the filter, gain and input pots stay unconnected? i hate to be that guy, but check the notes. if there's no mention of a lug being used, or it's not shown connected in the layout itself then it's not connected to anything. just follow the layout. Actually that's not that stupid question from a newcomer. I do recall asking this once myself in 2010. But yeah. No mention of connection means that those are left unconnected. my cuts left a sliver of copper leaving a bridge. Up and running now. What an amazing pedal!!! Just drips molten harmonics. Is D3 just used for polarity protection? disappointed with BC550 sounds weak, witth 5088 sounds better but is a fat fuzz not even light distortion, sounds undefined, chords sounds good but siple notes just sounds terrible, I made it sounds acceptable with tube amp. 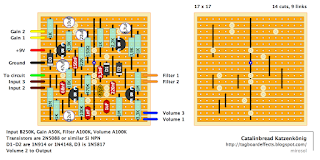 how to get filter knob more trebly is to fat sound or to bassy, which mod can I do mo get a littel more treble? 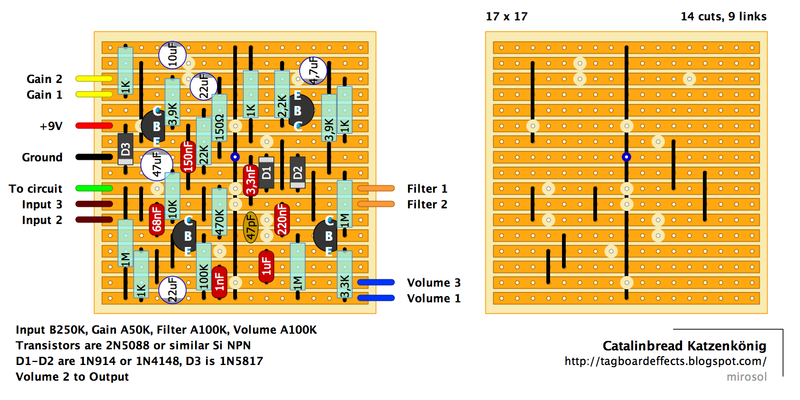 Check the schematic and figure out how the filter control works. Then modding it your needs is easy. I made a mistake and after 1 week of fighting against schematics I realised that I put 1uf instead of 1nf on input to ground, so I made the change and now is a killing pedal! I will try to low 220nf as rat reference but how to get more compress and tight distortion? Hi Claudio, you can try lowering the input cap, try values between 10nf and 47nF. -Is that blue dot in the center where those two wires are soldered? I see that it's linking to the strip that's attached to the Ground, so it makes sense, just thought I'd double check. -The wire coming off of the left side labled "To circuit." What does that mean and where is it connected to? You're correct abut the "double link". Both links connect to a single hole/strip. can i use 1uf bipolar caps? i only have that one in stock. 1uf/50v. You could also get away with polarised for 1µ caps. Negative to ground and negative to volume 3. And thanks for the layout to. I bulit this one, but the sound was gated. I used four 2n3904. Can anyone help?